In its first year of existence, Latrobe’s Rotary Club did not have a regular meeting site. Individual members would “host” the club, arranging a location and often serving the meal themselves, with the help of some member volunteers. By the end of 1921 they were meeting fairly regularly at the Plaza Hotel on Main Street, and by 1924 they had moved to the Hines Hotel (located where the Latrobe Municipal Building now stands). From 1928 until 1939 they met at the American Legion home, with occasional meetings at such locations as the dining room of the Masonic Hall or at the Miller Hotel. Latrobe Country Club welcomed the Rotarians from 1939 until 1962, interrupted only for a brief time during World War II when gas rationing forced the club to find a meeting site within walking distance. 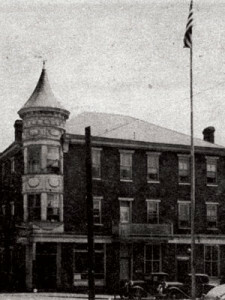 Thus, for a few months in 1943, the club met a Vogle’s Hotel (formerly the Hines Hotel). Beginning in 1962 the meetings were held at the Sons of Italy Social Club at the corner of Thompson and Jefferson Streets, except for a period when repairs were being made to the building. When the Sons of Italy closed that site, the meetings were held for a brief time at The Station. Periodically the meetings have been held at other locations for special programs or events. For example, a meeting in October of 1921 was held at the High School, with the meal being prepared by the Domestic Science Department. On several occasions the Rotarians and Rotary Anns met at the Boy Scout camp and prepared their own meal over a campfire. For many years the Rotarians regularly attended a joint meetings with the other service clubs at the Miller Hotel. At first, the meetings were not held at a regular time. In June of 1921 it was decided to alternate the meetings, having luncheon one week and an evening dinner the next. The meeting days also varied. By 1924, though, the club was meeting regularly at 12:15 on Mondays. Eventually the day was changed to Tuesday, and on January 18, 1933, the club voted to change the meeting date to Wednesday.